I use it as a card holder and enjoy changing my greeting cards as they show up. Bought for daughter and granddaughters. They love them! At first I ordered these as replacements for my fridge magnets, until I really saw how they work. I've got a whole new use for them - and many others. Can't wait to order more! Giving this to our teenage granddaughter for her birthday, but had to check it out first. Love it. Love the style and the sparkle, and nice to have the flexibility to change the pictures as needed. I was doubtful but it works! I use it to hang the kids art work on and those tiny magnets really do work. Great for displaying pictures and work! These are great! This is a repeat order. I purchase them for my Mom, who resides in a nursing home. She has one Cori strip to hang things from, and these allow her to see plenty of pictures and cards decorating her wall. Would be just as perfect for dorms, rental property, it to display any revolving picture menagerie. I highly recommend them! Good, strong hold! Great product--especially in silver looks very sleek and "techy"
The Photo Cable is easy to use, attractive, and very handy if you have a tall narrow space. First I ordered just one, then ordered more to use as gifts. If preferred, you can use it horizontally easily by also attaching the "ball" end, as well as the loop, to the wall. CAUTION--don't use this where babies or small children can easily reach the magnets. Gave it as a gift to my sister and it really cleans up the clutter and she can change the photos whenever she wants. Less clutter! I wish I actually got to use them. As soon as they were out of the box my sons snagged them for their rooms. The magnets are strong enough to hold postcards, drawings, and even a few sheets of homework. So much nicer to look at than tape, and gentler on the walls. Sliding the magnets around is pretty entertaining all on its own, too. Now I need to order more for myself. 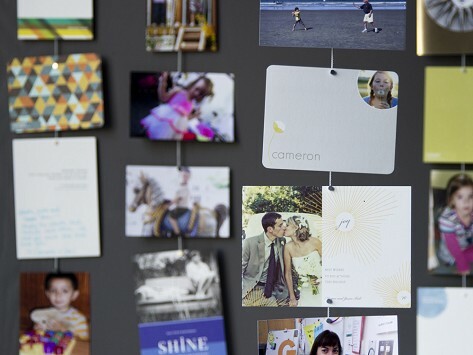 Why tuck your favorite photos away in an album when you can enjoy them every day with Mishu Photo Cables—an easy way to hang photos, cards, and keepsakes without poking a bazillion holes in your walls. No more tape marks or sticky residue either. Just one thumb tack is all it takes. Each photo cable includes nine decorative, little magnets. What these magnets lack in size, they more than make up for in style and strength. Each rare earth magnet can hold up to five sheets of paper. Choose the magnet that best suits your decor and use it for everything from pictures to ticket stubs and other memorabilia.